I just love love. I fall to pieces over a mushy love note, gush at Hallmark commercials, and keep every last sentimental scribble my children have ever given me. So imagine how my insides are upside down right now since the discovery of a treasured wedding ring I was sure was gone forever. 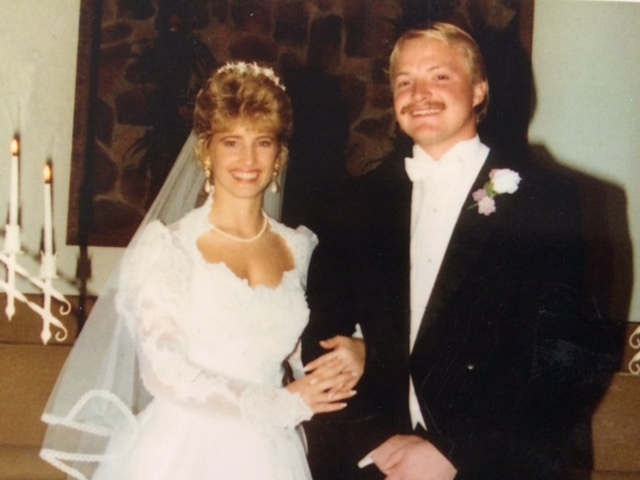 Nearly two years ago, I combed everything I owned in search of the solitaire diamond ring my husband had given me the night he proposed September 29, 1989. Married December 23 of the same year, I’ve never wanted another ring. I didn’t care that we could since afford a bigger diamond or that white gold is now in vogue. Jon chose it, spent what was equivalent to a fortune for a twenty-two-year-old struggling fisherman, and surprised me with it the day he drove into Seaford, DE after a cross-country trek from Alaska. 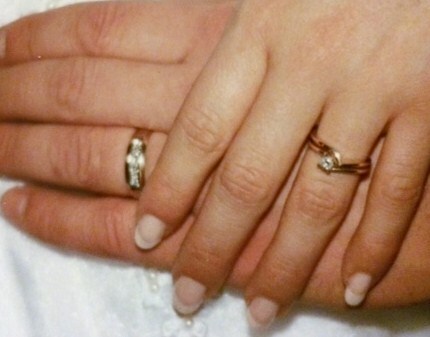 To me, it symbolized eternity as we vowed to walk through our dreams hand in hand. So when it disappeared on our own drive home from a summer of fishing in Alaska, I was heart-broken. Oh, I know it’s just a thing, but that ring was more than gold and a diamond. It was our story. I had worn it through every heartwarming moment and every heartbreaking argument Jon and I ever shared, through promises whispered and threats shouted, through successes gained and battles lost. It told of four babies delivered in hospitals and two in heaven, and it devastated me that I would not pass it on to the next generation as I passed along the stories that accompanied it. After Christmas this year, I searched through every last piece of clothing I’d ever worn for that ring before giving up hope for good. I sat cross-legged on the attic floor alone and cried, feeling silly that I couldn’t let it go. Now here it is, the day before Valentine’s and I found what I was looking for where I never even thought to look. As I dumped the contents of an old tote bag I carry with me everywhere, I noticed a zipper I didn’t remember being there and tucked inside of it was my ring. It had been with me all along. What was lost is found and I can wear it again, not just as a symbol of a forever marriage but of restored hope. Perhaps your marriage could use a little of that. Perhaps you’ve been looking for what once was, and are losing hope. Maybe like my ring, what you long for has been with you all along and you just don’t know where to look. I pray you don’t stop believing for it but also don’t live grieving over it in the meantime. God knows what your heart longs for and He is the giver of all good things (James 1:17). Even if He doesn’t give you what you’re looking for, He’ll always give you what you need. All you have to do is ask (James 4:2, John 14:13). Valentine’s Day has changed since my husband and I first married. Romance looks a little different. It rarely includes late-night dates and dancing on the beach, but it is full of something much more real. After years of bandaging boo-boos together, settling sibling rivalry, surviving difficult diagnoses, we have learned what real love is. It’s not all candy hearts and chocolates (although I highly recommend the latter). It’s a story of two clueless people who defied the odds and found exactly what they were looking for. I pray you’ll be inspired to do the same. This entry was posted in Faith, Family, Love, Marriage, Uncategorized and tagged hope, Love, marriage, Valentines Day, wedding, wedding ring by Rita Clucas. Bookmark the permalink. This story was renewed hope for me! I too lost my engagement ring, but mine was lost almost 4 years ago on Brielle’s due date, May 6th. All thing are possible! Amen Jessica! You never know what sweet gifts lie ahead :-).